Do you have a single pane window that broke and need it fixed ASAP? SR Windows & Glass offers same-day service for any size single pane windows in stock thicknesses. Most single pane window glass is annealed glass that is 0.125″ or 0.094″ thick. 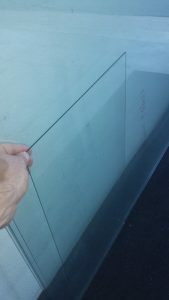 We stock this type of flat glass in our warehouse and on our trucks so we can respond very quickly to your requests for repair or window glass replacement. When you call, please let us know your situation and we’ll do our best to work you in our daily route. Our glaziers will measure your broken window and then cut glass onsite to fit your window. All of our pricing includes removal of the broken glass, cutting of the new glass to custom fit your window and installation of the new window glass. We provide a warranty for all of our glass and installation services. Because most single pane windows are made from annealed glass, please don’t try to remove the glass yourself. It is extremely sharp and will cut someone who attempts to handle it without the proper protection. When our glazier arrives, they’ll assess the damage and work with our sales team to give you a price quote before any work begins. Please call our glass shop in Phoenix or submit an online quote form and a representative will contact you immediately to discuss all of your glass service needs.